The vehicles are Storm armoured personnel carriers made by Qatari company Stark Motors. They were handed over in a ceremony in Mogadishu attended by Somalia Defense Minister Hassan Ali Mohamed (Amar-dambe) and Somali chief of defence Forces Dahir Adan Elmi (Indhaqarshe). Some of the vehicles are fitted with open-topped weapons turrets, but not weapons. The donation is a sign that Doha is pushing for influence in Somalia with the role of its Gulf rival, the United Arab Emirates, under strain. Somalia has refused to take sides in the rift between Qatar and Saudi Arabia, a UAE ally. But relations with the UAE have become strained over the UAE’s investments in the breakaway region of Somaliland. In April, Somalia disbanded a UAE program to train some of its troops. The Storm is made by Qatar’s Stark Motors, which was established in 2017 as the country’s first armoured vehicle manufacturer. The vehicle is based on a Toyota Land Cruiser 79 series chassis, powered by a 4.5 litre V8 turbodiesel developing 195 hp. It has accommodation for either six plus two or eight plus two. According to Stark Motors, the vehicle is armoured to CEN B6 level protection, and this covers the engine, sidewalls, roof, windshield, underbody and doors. The floor is protected against two DM 51 hand grenades. The vehicles delivered to Mali have a weapon station for a machinegun or automatic grenade launcher above the troop compartment. Qatar recently donated Storm armoured personnel carriers to Mali. On 26 December, 24 vehicles were delivered to the Armed Forces of Mali to assist it combat terrorist groups in the area. They will be used by Mali as well as the other four countries of the G5 Sahel group, which are Burkina Faso, Chad, Mauritania, and Niger. They will be used to combat Boko Haram, Islamic State and other terror groups in the region, especially in areas where there is a high risk from improvised explosive devices (IEDs). The vehicles donated to Mali appear slightly different to those delivered to Somalia, with the Malian vehicles featuring police equipment such as flashing lights and different turrets. They also have two back windows rather than the three on the vehicles delivered to Somalia. Most of Somalia’s military vehicles in service have been donated by other countries. For example, in late 2017, the country received Tiger 4×4 armoured vehicles made by China’s Shaanxi Baoji Special Vehicles Company. In 2015 the Interim Jubba Administration of Somalia received at least half a dozen RG31s and around a dozen Toyota Land Cruisers from the United Arab Emirates (UAE) and in 2014 the UAE’s armed forces donated vehicles and equipment to the Somali National Security and Intelligence Agencies. Also in 2015, the Italian government donated 54 vehicles to the Somali National Army as part of efforts to strengthen its ability to combat al Shabaab militants and other security challenges. The shipment included trucks and 5 MAV 5 light armoured vehicles, based on the IVECO 40.10 and capable of carrying six personnel. In April 2014, Italy delivered 30 vehicles to the Somali Police Corps in the first instalment of materiel donated by the Italian ministry of defence to Somalia’s armed forces.. 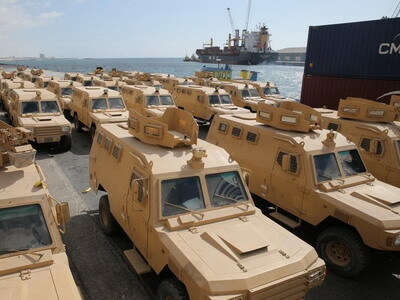 According to the Stockholm International Peace Research Institute’s Arms Transfers database, since 2014 Somalia has received 13 Acmat Bastion armoured personnel carriers, nine second hand Reva armoured personnel carriers and six second hand RG31 Nyalas (the latter two from the UAE). IHS Janes also reports that Somalia has taken delivery of 50 AT105 Saxon armoured personnel carriers.